14 Commercial Real Estate & Properties in Cheltenham are listed in 3 categories. We have 8 OfficesLease , 4 Retail ShopsLease and 2 Industrial Warehouses Lease . Innovative Working Environment | Fitted And Furnished | Modern Facilities $155pw | 2 Person Workspa..
PROPERTY OVERVIEW $155pw Price incl. Brand new coworking office in Cheltenham that combines flexibility, connectivity and simplicity for an amazing workspace solution. Already attracting professionals and businesses in industries such as property, recruitment, construction, law and coaching, this purpose built coworking space features cutting edge technology including fast Wi Fi, video conferencing, power access, commercial printing and smart tech to keep your innovative business at the forefront of Melbourne’s ever evolving business scape. Quality furniture and natural light make this office as comfortable as it is professional while an informal meeting room and professional boardroom give great spaces to welcome clients. Flexible bespoke memberships available now through Office Hub. This vibrant shared office space is the perfect solution for freelancers, startups and small businesses in the Bayside region of Melbourne. Situated in a small retail precinct along Bay Road, the boutique building is shouldered by other small businesses and retail offerings in a close working community. Despite the peaceful suburban environment, Westfield Cheltenham is just a short walk away offering fantastic conveniences including supermarkets, banks, shops, cafes and restaurants. Melbourne CBD is under an hour away by car or public transport. If you’re looking to reduce commute time and stay more connected to your lifestyle, this Bayside coworking space is a great option. The advertised office space is perfect for a team of 2. If you need more or less space, we have over 30,000 furnished workspaces all over the world suitable for a team of 1 to 200+. Our award winning team offer a free service that will help you find the perfect solution for your needs, so reach out if you need more help. What you get for your weekly rent , 24/7 Access , 24/7 Security , Access to internal breakout areas , Access to kitchen facilities , Access to secure printer and scanner , Building outgoings included , Electricity usage included , Fully equipped boardrooms, meeting rooms , Premium coffee/tea facilities , Regular cleaning , Secure high speed Internet Building features , Abundance of natural light , Air conditioning , Boutique low rise buidling , Car parking in building (Paid) , Creative space , Close to public transport , Print, scan and copy facilities 500m to Southland Tram Stop Super close to Westfield Southland Close to Victoria Golf Club and Cheltenham Park Reserve Who is Office Hub? Office Hub is the world\'s No.1 marketplace for office space. We have a huge global selection of coworking spaces, serviced offices and shared office spaces with flexible options to suit teams from 1 200 people. We\'ll take you on a tour of all the workspaces that fit your needs and work on your behalf to get the best price possible. We\'ll help you discover how shared office space can be the most beneficial and budget friendly solution for your business. www.office hub.com Conditions apply – the advertised price includes any incentives offered based on a 12 month agreement and is available to new tenants only. Please note that the rental rate may increase for a shorter rental period. A portion of the square meterage factors in access to shared space. Innovative Working Environment | Close To Public Transport | Inspiring Creative Space $58pw | 1 Person Workspac..
PROPERTY OVERVIEW $58pw Price incl. Dream big and achieve more at this standout coworking hub in Cheltenham. It’s got all the coworking staples: fast Wi Fi, coffee, air con – but that’s just the tip of the iceberg. Let’s explore the two level office: downstairs is smart AI technology like Alexa, TVs for projects and entertainment and green plants gloriously cascading off the walls to add fresh oxygen and boost members’ wellbeing. Custom desks and imported chairs keep the chiropractor away and out the back is a bar, kitchen, chill area with books, warehouse storage and a professional photography studio with coloured screens. Upstairs it’s all about space, light and more plants – all can be found in the impressive but not intimidating boardroom, meeting room with a calming blue and white theme, the full kitchen and bathrooms and a chill area that looks like it could be your own lounge at home! All this creates a sociable atmosphere that blends comfort and productivity in the ultimate community based workplace. Calling all disruptors, entrepreneurs and innovative small businesses – here’s your chance to grow alongside like minds at a unique and affordable coworking space in Cheltenham. Flexible terms and availability for teams of 1 6 people available now! This cowork hub occupies a two storey commercial building on Bay Road in convenient Cheltenham with warehouse storage and a photography studio as well as office spaces. The well built building has been recently refurbished and features giant windows to flood the interiors with natural light. Kitchens and bathrooms are new, air conditioning keeps the whole space temperate and comfortable and the warehouse at the back of the facility provides a place for storage and the ability for large deliveries – pallet racking is available for long term use (6+ months) at an additional $100 per month per pallet. This accessible spot will keep your team’s commute easy – there are bus stops right outside, Southland Train Station is at the end of the road and there is plenty of free street parking in the area. The amenities of Westfield Southland including supermarkets, department stores, gyms, cafes and shops are also just a short walk away. The advertised office space is perfect for a team of 1. If you need more or less space, we have over 30,000 furnished workspaces all over the world suitable for a team of 1 to 200+. Our award winning team offer a free service that will help you find the perfect solution for your needs, so reach out if you need more help. What you get for your weekly rent , Dedicated ground floor desk with 24x7 access , 4 hours meeting room usage per month , 4 hours free access to boardroom per month (& reduced rates) , Building outgoings included , Regular cleaning , Secure high speed Internet , Electricity usage included , Access to kitchen facilities with premium coffee/tea , One simple bill for everything related to your workspace Building features , 24/7 Security , Abundance of natural light , Pallet racking available (6 months+), $100/month per pallet , Car parking Street (Free) , Disabled access and facilities , Gym and fitness centre close by , Retail and shopping malls nearby 650m from Southland Shopping Centre. 120m to great and affordable Chatter Cat Cafe The well known Brewing house & Eatery, Bad Shepherd is only 25m away! 1.1 km to Highett Train station and 2.4km to Southland Train Stations. Connect & Hammer Gym + many other gyms within 500m. Who is Office Hub? Office Hub is the world\'s No.1 marketplace for office space. We have a huge global selection of coworking spaces, serviced offices and shared office spaces with flexible options to suit teams from 1 200 people. We\'ll take you on a tour of all the workspaces that fit your needs and work on your behalf to get the best price possible. We\'ll help you discover how shared office space can be the most beneficial and budget friendly solution for your business. www.office hub.com Conditions apply – the advertised price includes any incentives offered based on a 12 month agreement and is available to new tenants only. Please note that the rental rate may increase for a shorter rental period. A portion of the square meterage factors in access to shared space. Perfect Starter / Storage Warehouse $14,500 p/a + GST + Outgo..
Abundance Of Natural Light | Cafes And Shops Nearby | Regular Cleaning $725pw | 7 Person Workspa..
Abundance Of Natural Light | Regular Cleaning | Free Street Parking $621pw | 5 Person Workspa..
PROPERTY OVERVIEW $621pw Price incl. Dream big and achieve more at this standout coworking hub in Cheltenham. It’s got all the coworking staples: fast Wi Fi, coffee, air con – but that’s just the tip of the iceberg. Let’s explore the two level office: downstairs is smart AI technology like Alexa, TVs for projects and entertainment and green plants gloriously cascading off the walls to add fresh oxygen and boost members’ wellbeing. 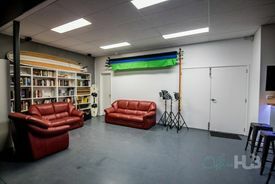 Custom desks and imported chairs keep the chiropractor away and out the back is a bar, kitchen, chill area with books, warehouse storage and a professional photography studio with coloured screens. Upstairs it’s all about space, light and more plants – all can be found in the impressive but not intimidating boardroom, meeting room with a calming blue and white theme, the full kitchen and bathrooms and a chill area that looks like it could be your own lounge at home! All this creates a sociable atmosphere that blends comfort and productivity in the ultimate community based workplace. Calling all disruptors, entrepreneurs and innovative small businesses – here’s your chance to grow alongside like minds at a unique and affordable coworking space in Cheltenham. Flexible terms and availability for teams of 1 6 people available now! This cowork hub occupies a two storey commercial building on Bay Road in convenient Cheltenham with warehouse storage and a photography studio as well as office spaces. The well built building has been recently refurbished and features giant windows to flood the interiors with natural light. Kitchens and bathrooms are new, air conditioning keeps the whole space temperate and comfortable and the warehouse at the back of the facility provides a place for storage and the ability for large deliveries – pallet racking is available for long term use (6+ months) at an additional $100 per month per pallet. This accessible spot will keep your team’s commute easy – there are bus stops right outside, Southland Train Station is at the end of the road and there is plenty of free street parking in the area. The amenities of Westfield Southland including supermarkets, department stores, gyms, cafes and shops are also just a short walk away. The advertised office space is perfect for a team of 5. If you need more or less space, we have over 30,000 furnished workspaces all over the world suitable for a team of 1 to 200+. Our award winning team offer a free service that will help you find the perfect solution for your needs, so reach out if you need more help. What you get for your weekly rent , Premium dedicated desk on the executive first floor , 24x7 access , 6 hours meeting room usage per month , 4 hours free access to boardroom per month (& reduced rates) , Building outgoings included , Regular cleaning , Secure high speed Internet , Electricity usage included , Access to kitchen facilities with premium coffee/tea , One simple bill for everything related to your workspace Building features , Abundance of natural light , 24/7 Security , Pallet racking available (6 months+), $100/month per pallet , Car parking Street (Free) , Disabled access and facilities , Gym and fitness centre close by , Retail and shopping malls nearby 650m from Southland Shopping Centre. 120m to great and affordable Chatter Cat Cafe The well known Brewing house & Eatery, Bad Shepherd is only 25m away! 1.1 km to Highett Train station and 2.4km to Southland Train Stations. Connect & Hammer Gym + many other gyms within 500m. Who is Office Hub? Office Hub is the world\'s No.1 marketplace for office space. We have a huge global selection of coworking spaces, serviced offices and shared office spaces with flexible options to suit teams from 1 200 people. We\'ll take you on a tour of all the workspaces that fit your needs and work on your behalf to get the best price possible. We\'ll help you discover how shared office space can be the most beneficial and budget friendly solution for your business. www.office hub.com Conditions apply – the advertised price includes any incentives offered based on a 12 month agreement and is available to new tenants only. Please note that the rental rate may increase for a shorter rental period. A portion of the square meterage factors in access to shared space. Brightly Lit | Innovative Working Environment | Free Meeting Rooms $1056pw | 9 Person Worksp..
PROPERTY OVERVIEW $1056pw Price incl. Dream big and achieve more at this standout coworking hub in Cheltenham. It’s got all the coworking staples: fast Wi Fi, coffee, air con – but that’s just the tip of the iceberg. Let’s explore the two level office: downstairs is smart AI technology like Alexa, TVs for projects and entertainment and green plants gloriously cascading off the walls to add fresh oxygen and boost members’ wellbeing. Custom desks and imported chairs keep the chiropractor away and out the back is a bar, kitchen, chill area with books, warehouse storage and a professional photography studio with coloured screens. Upstairs it’s all about space, light and more plants – all can be found in the impressive but not intimidating boardroom, meeting room with a calming blue and white theme, the full kitchen and bathrooms and a chill area that looks like it could be your own lounge at home! All this creates a sociable atmosphere that blends comfort and productivity in the ultimate community based workplace. Calling all disruptors, entrepreneurs and innovative small businesses – here’s your chance to grow alongside like minds at a unique and affordable coworking space in Cheltenham. Flexible terms and availability for teams of 1 6 people available now! This cowork hub occupies a two storey commercial building on Bay Road in convenient Cheltenham with warehouse storage and a photography studio as well as office spaces. The well built building has been recently refurbished and features giant windows to flood the interiors with natural light. Kitchens and bathrooms are new, air conditioning keeps the whole space temperate and comfortable and the warehouse at the back of the facility provides a place for storage and the ability for large deliveries – pallet racking is available for long term use (6+ months) at an additional $100 per month per pallet. This accessible spot will keep your team’s commute easy – there are bus stops right outside, Southland Train Station is at the end of the road and there is plenty of free street parking in the area. The amenities of Westfield Southland including supermarkets, department stores, gyms, cafes and shops are also just a short walk away. The advertised office space is perfect for a team of 9. If you need more or less space, we have over 30,000 furnished workspaces all over the world suitable for a team of 1 to 200+. Our award winning team offer a free service that will help you find the perfect solution for your needs, so reach out if you need more help. What you get for your weekly rent , Premium dedicated desk on the executive first floor , 24x7 access , 6 hours meeting room usage per month , 4 hours free access to boardroom per month (& reduced rates) , Building outgoings included , Regular cleaning , Secure high speed Internet , Electricity usage included , Access to kitchen facilities with premium coffee/tea , One simple bill for everything related to your workspace Building features , Abundance of natural light , 24/7 Security , Pallet racking available (6 months+), $100/month per pallet , Car parking Street (Free) , Disabled access and facilities , Gym and fitness centre close by , Retail and shopping malls nearby 650m from Southland Shopping Centre. 120m to great and affordable Chatter Cat Cafe The well known Brewing house & Eatery, Bad Shepherd is only 25m away! 1.1 km to Highett Train station and 2.4km to Southland Train Stations. Connect & Hammer Gym + many other gyms within 500m. Who is Office Hub? Office Hub is the world\'s No.1 marketplace for office space. We have a huge global selection of coworking spaces, serviced offices and shared office spaces with flexible options to suit teams from 1 200 people. We\'ll take you on a tour of all the workspaces that fit your needs and work on your behalf to get the best price possible. We\'ll help you discover how shared office space can be the most beneficial and budget friendly solution for your business. www.office hub.com Conditions apply – the advertised price includes any incentives offered based on a 12 month agreement and is available to new tenants only. Please note that the rental rate may increase for a shorter rental period. A portion of the square meterage factors in access to shared space. Cafes And Shops Nearby | Collaborative Space | Cheap Parking $475pw | 2 Person Workspa..
PROPERTY OVERVIEW $475pw Price incl. Brand new coworking office in Cheltenham that combines flexibility, connectivity and simplicity for an amazing workspace solution. 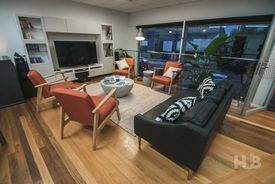 Already attracting professionals and businesses in industries such as property, recruitment, construction, law and coaching, this purpose built coworking space features cutting edge technology including fast Wi Fi, video conferencing, power access, commercial printing and smart tech to keep your innovative business at the forefront of Melbourne’s ever evolving business scape. Quality furniture and natural light make this office as comfortable as it is professional while an informal meeting room and professional boardroom give great spaces to welcome clients. Flexible bespoke memberships available now through Office Hub. This vibrant shared office space is the perfect solution for freelancers, startups and small businesses in the Bayside region of Melbourne. Situated in a small retail precinct along Bay Road, the boutique building is shouldered by other small businesses and retail offerings in a close working community. Despite the peaceful suburban environment, Westfield Cheltenham is just a short walk away offering fantastic conveniences including supermarkets, banks, shops, cafes and restaurants. Melbourne CBD is under an hour away by car or public transport. If you’re looking to reduce commute time and stay more connected to your lifestyle, this Bayside coworking space is a great option. The advertised office space is perfect for a team of 2. If you need more or less space, we have over 30,000 furnished workspaces all over the world suitable for a team of 1 to 200+. Our award winning team offer a free service that will help you find the perfect solution for your needs, so reach out if you need more help. What you get for your weekly rent , 24/7 Access , 24/7 Security , Access to internal breakout areas , Access to kitchen facilities , Access to secure printer and scanner , Building outgoings included , Electricity usage included , Fully equipped boardrooms, meeting rooms , Premium coffee/tea facilities , Regular cleaning , Secure high speed Internet Building features , Abundance of natural light , Air conditioning , Boutique low rise buidling , Car parking in building (Paid) , Creative space , Close to public transport , Print, scan and copy facilities 500m to Southland Tram Stop Super close to Westfield Southland Close to Victoria Golf Club and Cheltenham Park Reserve WHO IS OFFICE HUB? Office Hub has largest collection of shared office space, sublet office space, creative coworking office space and serviced offices, perfect for 1 200 employees. Let us take you on a tour of all the spaces that fit your needs and budget. Our service is complimentary and we work for you and the landlord to negotiate the most competitive deal in the market. Let us show you how shared and serviced offices can be the perfect solution for your business. www.office hub.com.au www.office hub.co.nz Conditions apply A portion of the square meterage factors in access to shared space. The advertised price includes any incentives offered based on a 12 month agreement. If a shorter period is agreed to please note the price may increase accordingly. This promotional offer for new tenants only and may be withdrawn at any time due to space availability. Modern And Well Presented Office / Warehouse In Central Location $23,500 per annum plus GS..
Modern Warehouse/offices In Highly Sought-after Estate! $30,000 per annum + GST +..
Prime Location - Ready To Go $28,500 p/a + GST + Outgo..